With the SAPPHIRE NOW + ASUG Annual Conference just weeks away, here are 6 great reasons to include SUSE partner – certified global managed services and hosting SAP partner Protera Technologies as a “must have” on your conference agenda this year! 1. Schedule an ONSITE STRATEGY MEETING with the expert Protera team – setup a meeting before you go! Thought SAP HANA was too expensive or worried about too much downtime? Think again. At Protera’s booth #1139 or Protera kiosk # 5 inside the SUSE booth, SAP customers can get a live demo to learn how they can leverage Protera FlexBridge Migration Services Platform to rapidly deploy SAP HANA, and S/4HANA into the cloud or into hybrid environments on SUSE, while in the process reducing project cycles, project costs, and support tasks by up to 70% – with only one down time! Get a hands-on demo of how Protera FlexBridge accelerates SAP migrations on SUSE to SAP HANA and S/4HANA. Be sure to stop by Protera’s kiosk #5 in the SUSE booth anytime throughout the conference to discuss your upcoming migration plans and leave the conference with a migration roadmap specific to your environment. Join Protera Chief Technology Officer Patrick Osterhaus at the SUSE booth #859 mini theatre on Thursday, June 7 at 3:15pm to learn how SAP customers are able to accelerate their migration to SAP HANA and S/4HANA on SUSE by leveraging the Protera FlexBridge migration automation services platform. The presentation includes real use cases from recent customer success stories with actual project costs and time savings as high as 70% when compared to traditional migration approaches. At the end of the presentation attendees will get an opportunity to register for a Migration Assessment – customized to your SAP environment . 5. Catch up and have fun with Protera and SUSE teams! Tuesday afternoon Protera will host ‘in booth’ executive receptions, be sure to stop by to grab a beer and learn how to accelerate your digital transformation journey on SUSE and increase the business value of your SAP investment. 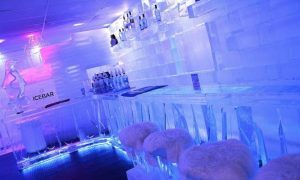 Protera and SUSE will also be co-sponsoring a networking reception Wednesday, June 6 from 9pm-12am at the Minus 5° Ice Bar – register now for the event. 6. Need more information regarding the biggest SAP event of the year? Protera has you covered! For more information and to get full event details view – Protera’s Event Schedule. Watch for live social posts throughout the conference with more information for attendees onsite! The Protera team is excited and looking forward to seeing everyone in Orlando!